Noting that his witticism about piers has gone unappreciated by the boys, in Nestor Stephen considers contributing it to "Haines's chapbook," recalling what Haines told him in Telemachus: "I intend to make a collection of your sayings if you will let me." But the prospect of becoming one more entertaining colonial writer read by snooty English overlords contributes to Stephen's depressive sense of historical futility. If he aided the tourist by contributing to his literary work (call it, say, Collected Utterances of an Authentic Irishman), Stephen would be doing so primarily with the aggressive intent of breaking through Haines' smug insensibility ("Tonight deftly amid wild drink and talk, to pierce the polished mail of his mind"), but the effect would be only to prostitute his artistic gifts to the English people's appropriating acceptance ("A jester at the court of his master, indulged and disesteemed, winning a clement master's praise"). Stephen reflects that many Irish writers have been willing to adopt the role of entertaining eccentric: "Why had they chosen all that part? Not wholly for the smooth caress. For them too history was a tale like any other too often heard, their land a pawnshop." Declan Kiberd writes perceptively about this "general tradition of Anglo-Irish comedy in England from Congreve to Shaw (who described himself jokingly as 'a faithful servant of the English people'). Joyce cast Wilde as 'court jester to the English,' who had a fatal propensity to turn any Irish artist into a mere entertainer. Haines's notebook represents a worrying reimportation of that tradition back into the colony, the 'pawn-shop' where everything is owned by someone living elsewhere and where all ideas come second-hand. Joyce sees the Irish reputation for wit and eloquence as an attempt to compensate for colonial oppression and material failure." In Proteus, Stephen will return once more to this question, comparing his literary co-optation to the schemes of various noble "pretenders" to occupy the throne of England: "For that are you pining, the bark of their applause? Pretenders: live their lives." 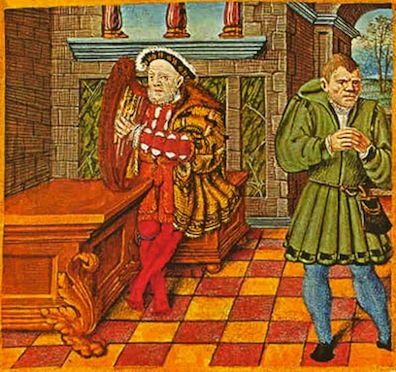 Henry VIII playing a harp in the company of his jester Will Somers, in the King's Psalter, dating probably from the later 16th century and held in the British Museum, London. Source: www.zwoje-scrolls.com.